Performer RPMs are dual-plane, high-rise intakes with 180° firing order to produce incredible top-end horsepower while retaining good throttle response. Their larger plenums and runners match the free-flowing exhaust, high-lift cams and other modifications of a high output engine. 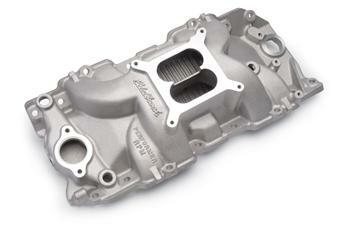 They are intended for high-performance street or competition engines that run up to 6500 rpm. They are not for emissions equipped engines. Edelbrock’s Performer RPM gives you the ultimate in street high-performance.